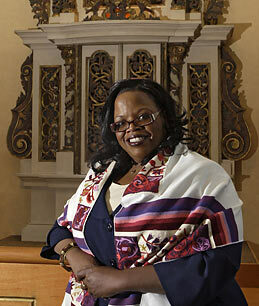 Um, a black, female rabbi, why? Meet Alysa Stanton, who was ordained on June 6 as mainstream Judaism's first-ever black female rabbi. She will become the rabbi at Congregation Bayt Shalom in Greenville, N.C., on Aug. 1. Stanton, 45, completed seven years of rabbinical training at Hebrew Union College-Jewish Institute of Religion in Cincinnati. She will become the first non-white rabbi of Congregation Bayt Shalom, which is a 60-family synagogue. Like so many others before her who've broken color barriers, Stanton chooses not to place the emphasis on her race. "I'm honored and awed by this achievement," she told Time magazine. "But I am foremost a rabbi who happens to be African-American, not The African-American Rabbi." That's the way it should be, of course. And Jackie Robinson was just a big league ballplayer who happened to be black. There ought to be a big deal made over any sort of significant bending, whether it's gender-based, race-based, or faith-based. Stanton hits the mark on all three. Fitting that it should happen the same year as we inaugurated the first African-American president in history. According to Diane Tobin, a demographer with the San Francisco-based Institute for Jewish and Community Research (IJCR), some 20% of American Jewry is now non-Caucasian. While there is no data specifically on black Jews, "a large percentage [of nonwhite Jews] are African American." Growing up in Ohio, Stanton was attracted initially to Eastern religions and Evangelicalism, until her family moved to a predominantly Jewish suburb of Cleveland. By her 20s, Stanton had found her home in Judaism. Despite her noble belief that she's just another rabbi, Stanton concedes that she's not, by appearances alone. "I definitely don't blend in," she says. "Worldwide, Jews come in every color and hue, but in America, mainstream Judaism is definitely an Anglo demographic." Oh, and Stanton also happens to be a divorced single mother of a 14-year-old girl. As if we needed to keep piling on to the list of anomalies that this woman has spawned. Meanwhile, over in Catholicism, the Church is beginning to relax some of its requirements to belong to the clergy, as the supply of priests is dwindling far quicker than they are being replenished. One of the relaxations is in the area of marriage--as in, priests can now have wives. The joke gets even better now. "So a priest comes in with his wife, and he sits down and has a beer with the black female rabbi..."
On second thought, maybe you don't need a punchline, after all. The demographer Tobin explains why American Jewry--and the same theory can be applied to the Catholic Church--are more open-minded nowadays. "Due to assimilation and intermarriage, the stability of the American Jewish community has never been more vulnerable," she says. "If we are to survive we must become more welcoming to people and not just send them away."